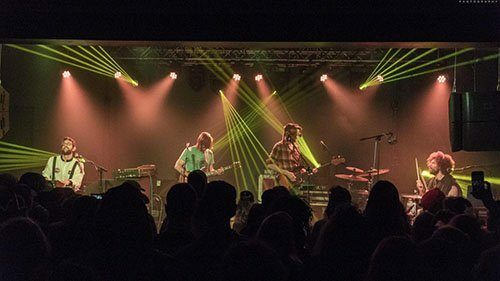 Having announced that they are taking all of 2018 off, many of their fans have been waiting for Dopapod to crisscross the country to see the band one last time. With the tour just starting, the quartet set off from the Northeast and celebrated Halloween at Putnam Den in Saratoga Springs, New York. The venue was recently given an overhaul with a new sound system, lighting rig, flooring and a raised ceiling. The place was packed and many people stated how happy they were with how improved the venue looked and sounded. Dopapod’s first set was composed entirely of original tunes. Walking on to the stage to “This Is Halloween” from The Nightmare Before Christmas, the band dove right into “Black and White” which included teases of the walk-on music. The band continued to keep the crowd on their toes with fantastic, patient jams in every song that was played. A wild “Mucho” was followed by “8 Years Ended” with guest drummer Vinnie Amico of moe. sitting-in. The crowd roared with approval as he took the stage. After the guest spot the band wrapped up with “Blast” and told the crowd to come back for the special second set they had planned. When they came back out the set started innocently enough with a great version of the Grateful Dead’s “Eyes of the World” that seamlessly went into Black Sabbath’s “War Pigs.” The band then went into a head banging tune that sounded like it could be a Black Sabbath song, but instead the lyrics of “Scarlet Begonias” started and the smiles on many faces in the venue, including the band, shot a jolt of extra energy into the rest of the evening. “Black Sabbath” was then put to the music of “Terrapin Station” and the band had “Jerry Osbourne” (a costumed sound engineer Luke Stratton) come on stage to play along. Hearing these dark lyrics to such happy music, like the other Sabbath tunes during the night was slightly jarring, but to hear them in a new way was also refreshing. To finish off the set they blew into “Paranoid” but with the lyrics of “Fire On The Mountain.” There were teases of “Iron Man” as well thrown into the song and the crowd went wild for it when they heard it. As the band ended the crowd went nuts in appreciation for what the quartet had just accomplished. Rob thanked everyone and said they had wanted to do something like this for a long time. The encore was their own “Indian Grits” but played in the style of the Dead’s “Shakedown Street.” A fun end to the show that really is a must hear. It is a shame these guys are taking a year off, but if they continue to play like they are now, they’ll be ending this part of their career on a high note and hopefully come back even stronger.